Five o’clock this morning my alarm went off and I got out of bed. Its pitch black outside without a soul in sight, not even the psychotic neighbours, who I’m convinced don’t actually sleep (that right there is whole separate blog). I’m out of bed, I’m dressed and I’m out the door and headed to the West End to meet my friend (and new swim coach) for 6:30am. I’m out of bed, and clearly out of my mind. Its eerie driving through the West End at 6am on a Wednesday morning. The sun hasn’t even thought about rising yet, the shops are all still pretty shut up and there are only a few people around, wrapped up against the pre-dawn cold. And it is cold. Its been years since I saw this side of London, and back then I probably would have been headed to bed, rather just getting out of it. And I certainly wouldn’t have thought I’d ever be dragging myself out of slumber, willingly, at this hour to hit the pool. Before work. Like a lunatic. Thankfully the Oasis centre in Tottenham Court Road is warm, and although we were disappointed the heated outdoor pool wasn’t open yet, I was slightly relieved that I wouldn’t have to brave the cold wearing only my speedo full piece and some spangly goggles. The indoor pool would do! Then there’s nothing else for it. I have to jump in. And its more than a shock to the system when I get going. I’m very grateful to have a friend there, who is a very strong and experienced swimmer and talks me through the different lanes and has a look at my very rusty technique. The first thing that strikes me is how tough it is. Really, lung burning, muscle aching tough. I am not swimming fit at all. It reminded me of my first few C25K sessions, I had to stop every couple of lengths to catch my breath. Totally knackering. I also seem to have forgotten how to swim without inhaling half the pool. Cue much spluttering and the occasional fear I may actually forget to come up for air (yes, mad). Or get taken out by the super quick pensioner just behind me n the lane. 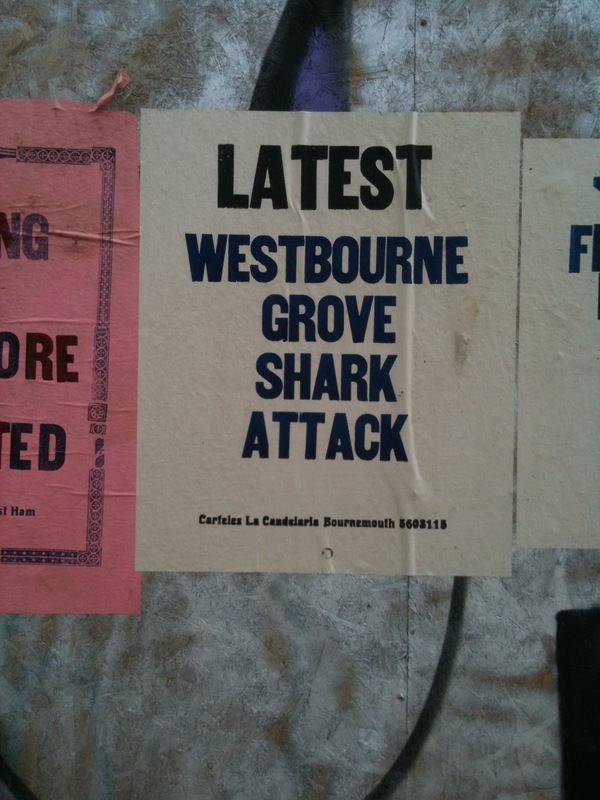 Its a jungle out there. To add to this farce, swimming freestyle highlights my terrible co-ordination, those neural pathways are non existent, I’ll need some lasers to burn these into my brain! I can’t get the breathing sorted as well as have my legs kicking as much as they should at the same time. Yup. It’s comedy value really. 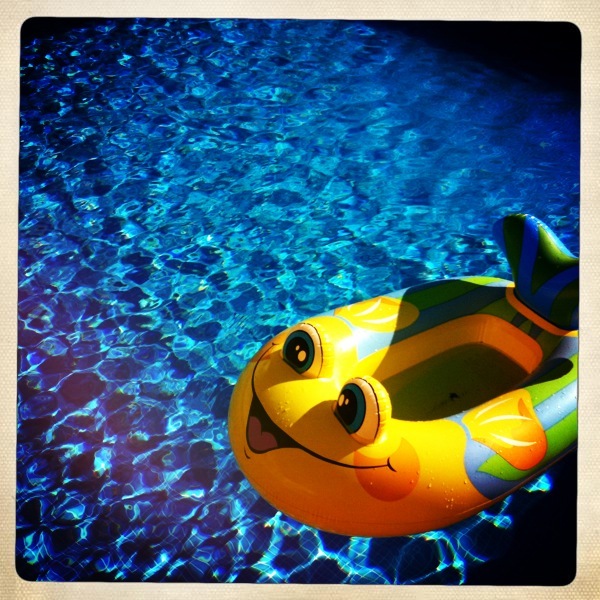 But with a few pointers from my swimming guru friend, and sensibly slowing the pace, I began to get into it. Managed about 35/40 minutes. Not bad going for session one. Now to ensure I fit in at least another three ahead of the Torture (sorry Physio) appointment. One of the many excuses I thought up to not go swimming. Two weeks since the race and a few follow up physio appointments later, its very clear that my running injury is a bit more complicated than I initially thought, and its going to take a lot more than a few weeks rest to get better. Pay attention, here comes the science bit, I’ll keep it brief. The year old calf injury from back in Feb 2011 has come back to haunt me, just in time for Halloween. Apparently this is fairly common as I didn’t get it properly looked at. This means my right calf has very little flexibility and my left leg has been compensating. Add to that the lazy glutes (as discussed here so I won’t go on), a pretty lackadaisical core and tight hips and HEY PRESTO! Awful awful ITB issues. What fun. The upshot of all of this is that I will not be running for at least another month while I focus on building up the flexibility and getting the right muscles ‘firing’. When I do start again, I have been advised to pretty much start again. They’re talking running for a minute, walking for three minutes… that kind of starting again. OH GOOD. But we’re also talking sorting out my posture, getting rid of that weird flick I do with my right foot, and getting stronger and faster all round. So there’s that to look forward to. In the meantime its been suggested I swim. Yes, swim. And not the faffing about in the pool I usually do, while on holiday. Proper swimming, using freestyle, to build my core strength. Its worth noting I haven’t been swimming for fitness purposes since 1994, back in Roosevelt High’s Grade 8 swim team, which I was a part of for precisely 2 days. I do not have fond memories of sporty ‘proper’ swimming in general. My high school pool was also used for diving so was suitably, very deep and I had this irrational fear that I’d dive in too deep and not reach the surface quickly enough. You know, before I drowned. I hated the horrid elastic caps that had to be dusted with baby powder so they didn’t stick together, and pulled my hair, the sting-your-eyes chlorine that also turned my hair green and made my skin itch. The unflattering school issue navy swimsuits. But needs, must and all that. I’ve had a bit of a look around the local leisure centre facilities, and with the hoards of screaming children, it looked just as daunting as my old school pool nearly 18 years ago. I left without even getting a toe wet. Not a good start then, so I’m just reminding myself I was just as terrified of my trainers when I first put them on. Flashbacks of shivering to the core wearing ill fitting brown nylon shorts on the starting line in the middle of winter come to mind. All the anticipation and anxiety, only to come last in sprints. Or falling over the hurdles. 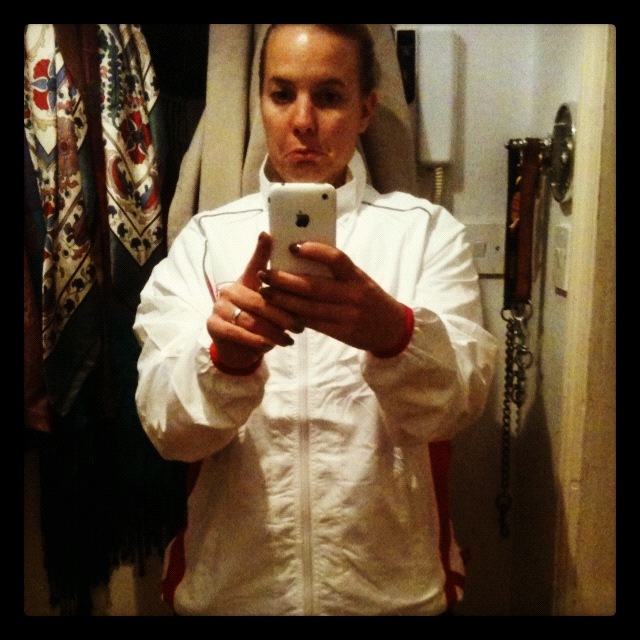 Its fair to say I loathed running, I found it humiliating and difficult. Now I find it something I pretty much can’t live without. So if I want to get back on it. I’m going to have to jump in the pool. I finished it. Yes. I finished. This is what I keep repeating to myself while alternating ice packs and hot water bottles while recovering on my sofa post 13.1 miles this morning. What a race. But for very different reasons. It was such a beautiful day, perfect weather, and everything was going incredibly smoothly, no delays, no queues, I was feeling relaxed and positive about the race. I had told myself that I wasn’t going for a PB, with my injury, I really just needed to get round. So no pressure. But once I was there absorbing the atmosphere, all the buzz in the air, the anticipation, part of me really thought the universe may just conspire to deliver me a 2:15. It was sunny after all. In October. Crazier things have happened. Right? Emily and I set off at a good pace and I honestly felt pretty awesome up until about mile 4 – so technically the very start of the race. Emily’s very uplifting chatter of, ‘we’re nearly a third of the way there!’ helped, for about another mile or so, and then I had to drop two more Nurofen to counteract the now, very painful ITB. And I stopped being able to keep to our pace. Come mile 6, and my sunny disposition was starting to darken. I was already tired, how can this be? Well I can tell you, three weeks with just cross training is a very poor substitute for the real thing. I kind of knew this in the back of my head, but again my over positive mind frame pre-race, let me conveniently forget it. Between miles 8 and 9 I thought it may just be over. Or at best I’d have to make peace with the fact I was going to hate every inch of the course left to run and may just cry my way through it. Nurofen helped a tad, but then the other ITB started to strain which threw me off my game plan completely. Both sides? Are YOU SERIOUS!? At this point I felt a tap on my shoulder, ‘you alright love?’ says a woman wearing the same charity shirt as me. And for once I didn’t try and front it out. I’m not sure if it was the implicit camaraderie as we were running for the same charity, or the fact that at this point I thought I may vomit, but instead I said; ‘Not really, having a pretty tough time, I’m injured blah erg, blah URG, blah *sob*’ And Julie just got it. And by some minor miracle, Julie was in a pretty similar state to me, and more than happy to keep me company while I just got myself back together. Having torn her calf muscle running the London Marathon earlier this year (at mile 16, with another 10 miles to go – and she still finished! ), she was looking at walk/ running the last 4 miles. Which sounded like a good Plan B to try and salvage the rest of the race, and possibly my ITB (and sanity). And from that point my race improved dramatically. 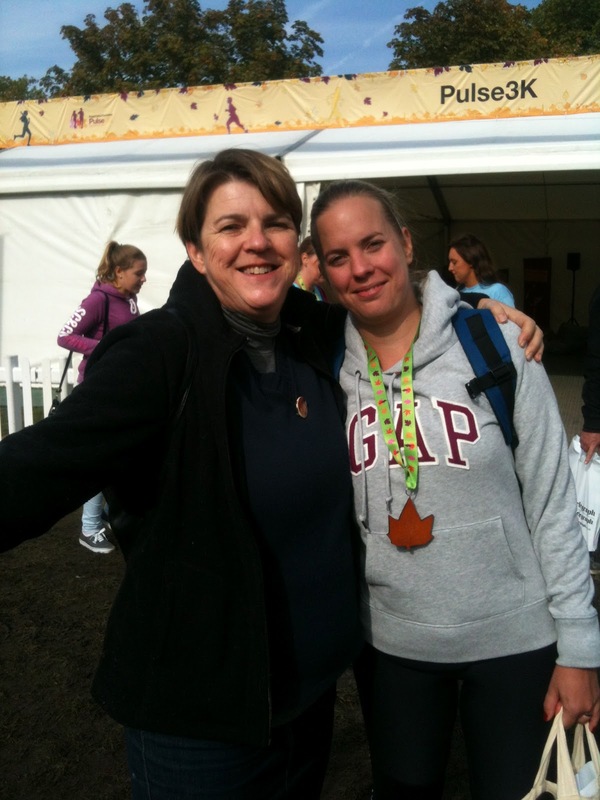 Julie’s fantastic demeanour and inspirational story helped distract from the pain, and well, we just had a laugh. I stopped taking it so seriously. I gave up the idea of getting anywhere near a PB. We talked to other runners. I managed to jump up and down enthusiastically when I saw my friends and family who came to support (ouch, but worth it). 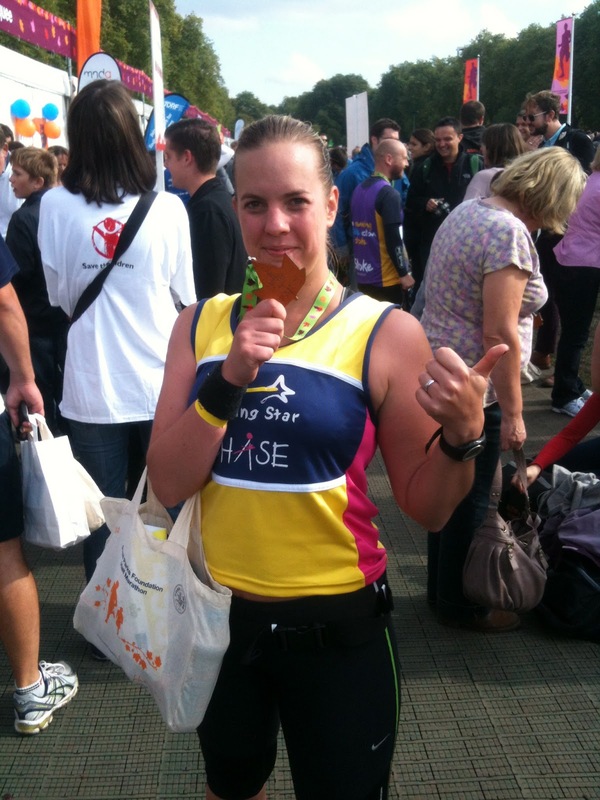 We helped first time half marathon runner Katie, manage a particularly nasty stitch. We waved at everyone. We made faces at the cameras. We finished with a spectacular 800 metre dash (er, hobble really), in just over 2 hours 39 minutes, actually smiling. Plan B. Now that’s nine minutes slower than my PB, but I’ll take that. Those nine minutes reminded me of something pretty core, that I had forgotten to have fun when training. It was all splits and miles logged and comparing schedules with other colleagues, desperately trying to achieve perfect form, and ultimately finding myself in a lot of pain on physio tables. Not fun really. At all. So I’m going to take some time out to recover, sort out the injury slowly and properly and then take to the street again, when its healed, without the expectation, or added pressure of an impending race. And just run, for fun. To feel good, and have a laugh. Until Paris next year that is! It’s been a pretty slow week. I have been putting my feet up pre the big race on Sunday on advice from my firm but fair physiotherapist. She has advised that any further impact training will just inflame the Irritable ITB even further, making running the half marathon this weekend pretty uncomfortable. And I have since come to learn, that my physio’s idea of ‘uncomfortable’ is my idea of ‘agony’. So I have resigned to cross training. And not the fun kind i.e. cycling/ rowing, which would just aggravate the hip flexors and ITB further. No I have been advised to use the actual Cross Trainer. The one with the arm movements and everything. IT IS SO VERY VERY BORING. I feel like one of those 80’s aerobics obsessives, swinging pony tail and retro headphones to boot. But anything to keep the cardio up, although I have to say after 6km on the damn thing I did contemplate throwing myself in front of the women on the treadmill opposite. Just for a thrill. My dark mood turned blue when I received the Elvis magazine along with White Jacket of Rejection through the post on Saturday. Those in the know will be nodding in recognition. 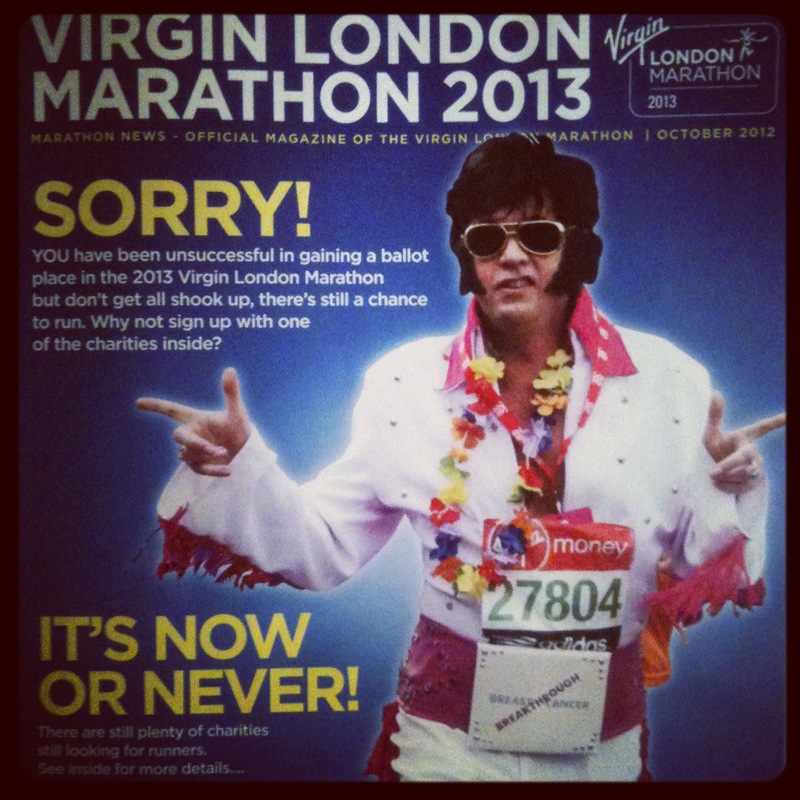 The news arrived, I didn’t get a place in the 2013 London Marathon. Sad Face (although secretly my physio is thrilled). But I have now got it my head that a marathon is the next challenge. Which begs the question, while I sit here popping nurofen having been through an excruciating hour of sports massage which practically had me crying for my mother, am I losing my mind? Along with a whole new vocab to describe pain, and precisely where it hurts (I thought ITB was some tax agency, and I won’t go into what I though the piriformis was), I also seem to have picked up a virulent strain of masochism. And when its going badly you can expect all of the above with the added joy of being injured. So there’s the frustration of not being able to actual clock the mileage (or clocking it through gritted teeth), and the fact that you are probably in additional pain in some for or another. Never mind the mental kicking you give yourself for getting injured in the first place, if its self inflicted, like mine. I earn my dinner and can eat with guilt free abandon! I have more confidence, getting medals is very rewarding! Ultimately it makes me a better human being to be around. So send your good vibes people, I just need enough to get round 13.1 miles on Sunday!